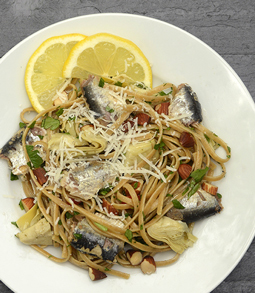 Pasta with Artichokes and Sardines - A recipe from Savor California, the online showcase for extraordinary gourmet foods and beverages from California. Meanwhile, combine the artichokes, sardines, pecorino, parsley, almonds, oil, lemon juice, ¼ teaspoon salt, and ½ teaspoon pepper in a large bowl. Serve topped with additional pecorino.